Mario learned karate at the feet of a master, and the trade of Ambulance Chasing at the feet of lawyers, but he’s no Karate kid, and he’s no lawyer. What he is, is a young man who found unlimited potential from hard beginnings. Volume 3 in the Ambulance Chaser series, Risky Business lays bare Mario’s pursuit of the Ambulance Chaser’s American dream through the hedonistic landscape of seventies Los Angeles. Visit the marathon of Mario Luna’s restless life. It’s not all sunshine and roses in Mario’s neck of the woods. Someone is trying to kill him. Is it a ghost out of his troubled past, or someone else? Having read two of George Hatcher’s prior books, Risky Business feels like a re-acquaintance with old friends. Several of the characters are familiar to me, with the exception of Melina. Melina is new in Mario’s life. She comes into his life at a most opportune time, when he’s at a low point in his life. His best friend and lover, Tanis, is killed in front of him, and Mario is devastated, and out for blood. In his small community, blood pays for blood with blood. He knows the bullet that took Tanis away from him was meant for him, what he doesn’t know is who wants him dead. He didn’t want the police involved, so he sets out on a mission to solve Tanis’ murder, all while hurting physically and emotionally. Throughout the time it takes to gather information, he keeps on with business as usual. That includes satisfying his enormous sexual appetite, oftentimes, with more than one woman at a time. Mario slows down a bit only when he meets Melina after she is involved in a car wreck. He tried to use Melina to replace Tanis, but once again, another attempt is made on his life. This one is eerily familiar, but it was only then that Mario finds out who wants him dead, and why. The book has a nice pace and is written in a dialogue that’s easy to follow. It kept me rapidly turning the pages to find out who put the hit out on Mario. He seems to be liked by everyone, especially the women in his life. When it is finally revealed, I’m left speechless because the plot was kept tight until the very end. Great suspenseful read with lots of action and genuine love all around. 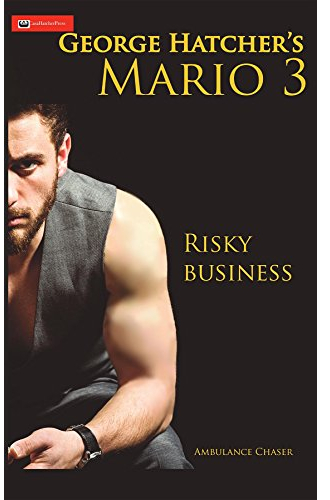 “Mario 3: Risky Business” is the third installment in George Hatcher’s “Ambulance Chasers” series, and the sequel to the past book, “Mario 2: Coming of Age.” In the start of the novel, Mario is sentenced to two years in federal prison. And then soon after, he gets out ahead of his sentence. And then his lover, Tanis, is murdered. And then suddenly, his life is thrown into a spiral. He thinks; was the bullet meant for me and not Tanis? Mario sets out on a plight to find out who is trying to kill him in this exciting third installment. Who is trying to kill Mario? The book is steadily paced, with a healthy dose of suspense and action. Like his previous novels, George Hatcher writes very eloquently, with descriptions that are evocative but also short to keep the pace of the book in tact. This installment proves that Hatcher really knows his craft, and knows how to write great crime-thrillers. Mario is a great character, and I definitely enjoyed him in this book. I love being able to follow a character not only throughout a book, but an entire book series. It’s quite unique to see this character’s coming of age, especially when you see them build their skills in relationships in previous novels. I am very anxious for the next addition of the books starring Mario. Hatcher surely knows how to write thrillers, and after three books I just adore his writing style, his intricate plots, and his characters.